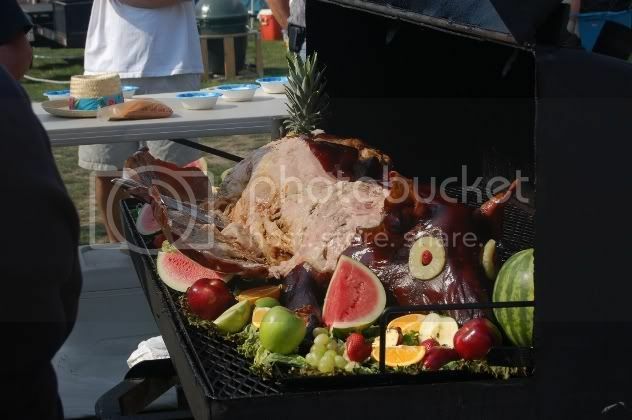 Many of us cook pig roasts for catered events. I probably cook 40-60 on average a year. My method of cooking is on an off-set cooker, or an off-set reverse flow cooker. The following applies to those of us that smoke, as opposed to using direct heat like Harry does using a rotisserie over live coals. As far as different techniques, please feel free to add your experiences and methods so others can also give that a try. There are times when a smoker just isn�t available, so direct cooking still offers the opportunity to get-r-done. 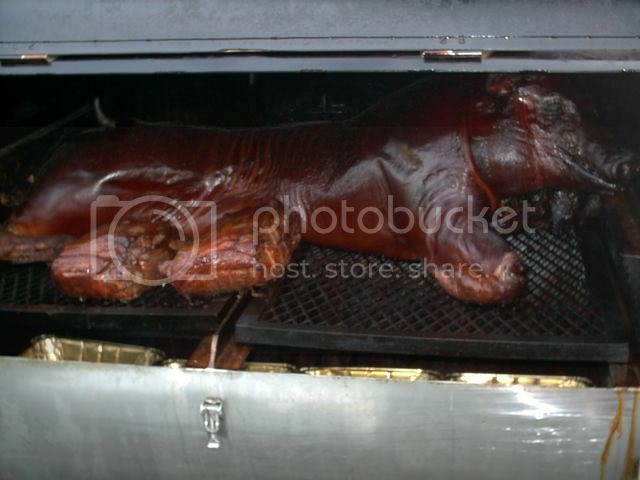 I also don�t cover cooking in a La Cage China �Box� as to me that is oven roasted pig, not smoked. Where do I buy my pig? 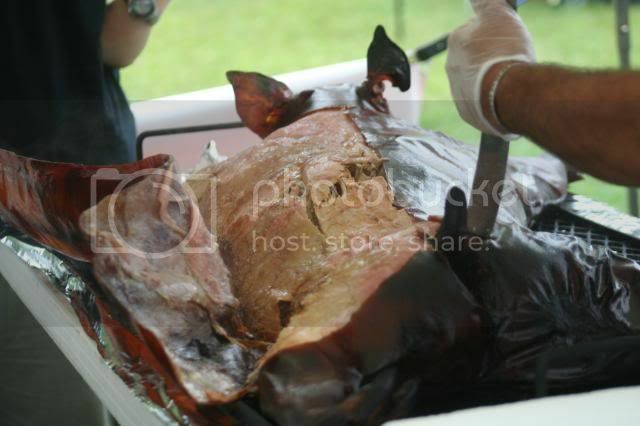 You will need to find a wholesaler or approved purveyor to purchase your pigs for catering. 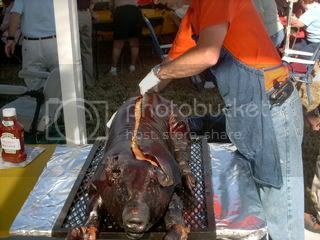 Wild pig is not acceptable for feeding the public. How big a pig do I need to buy? 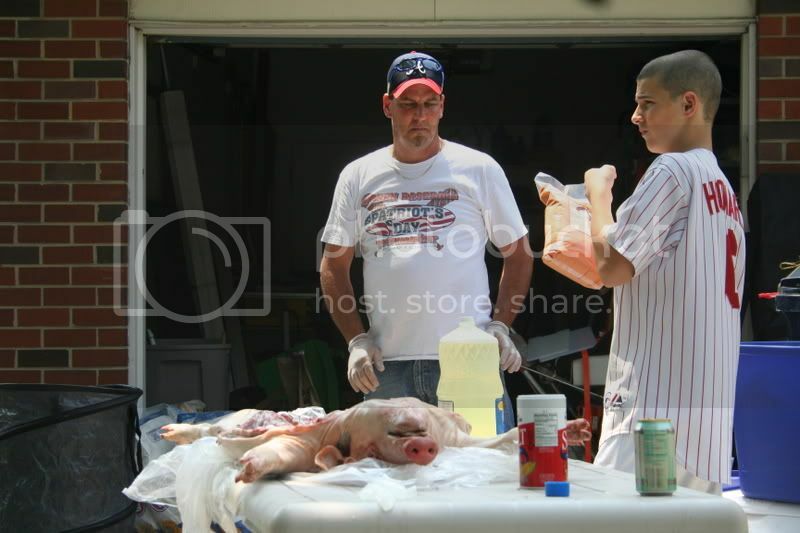 The unwritten rule for us is that 1 pound of uncooked piggy feeds one person. I normally err on the conservative side, and figure that a 100 pound pig comfortable feeds 80-85. One note on yield: if you cook to slicing temps, your yield will not be as high due to meat sticking to the bones. I cook to pullable temps, and get 100% yield of available meat. Your next step is to figure out method of cooking the beast. Butterfly open or racing style? Rotisserie or Carolina style over live coals cooking on a fixed grate? 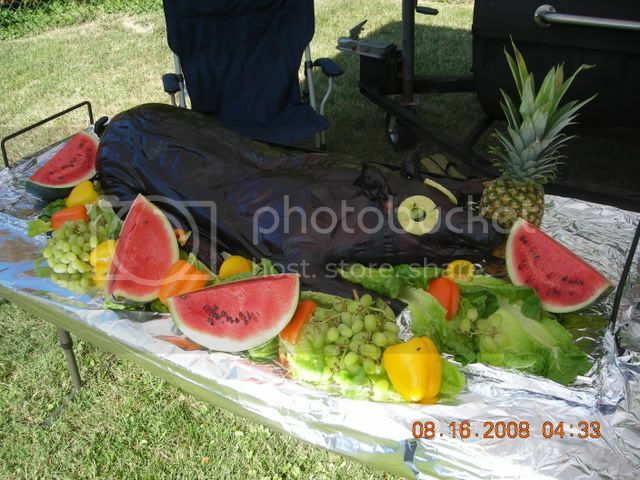 I cook racing style, and marinate my pig�s feet up in an extra large cooler with Mojo Carrillo. What is Mojo? It is available by the gallon in Hispanic grocers for a good price and consists of fruit juices and spices. 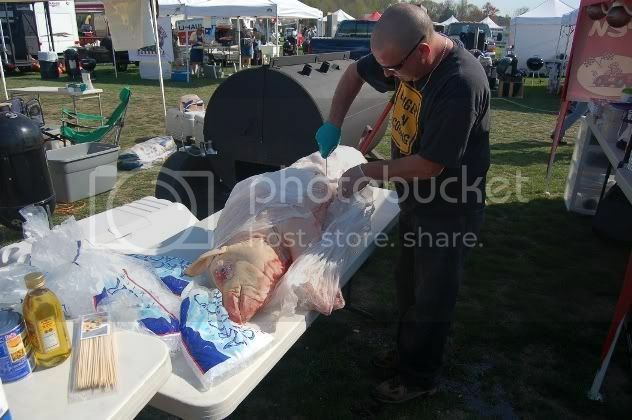 One-two gallons will do the job, then an ice bag(s) on top of the pig to keep it cold overnight. The marinated pig goes on the cooker at 225-250 throughout the cook. I cook to temp by feel, but for others wanting a more accurate method pullable pig needs to be cooked to 195-200 similar to pork butts. 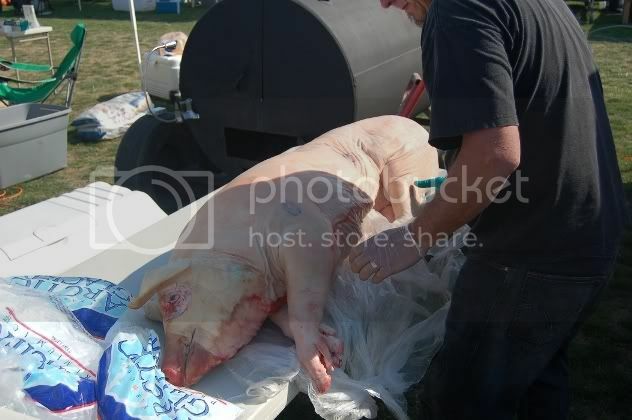 Timing varies due to the fat content, how cold the pig is going into the cooker, and your ability to maintain steady heat. My general experience is that it is always better to have the pig done early, and then throttle the heat back as needed to keep the pig at proper serving temps. Waiting for the pig to come up to temp and being late for serving is no big deal if you are cooking for friends and family. 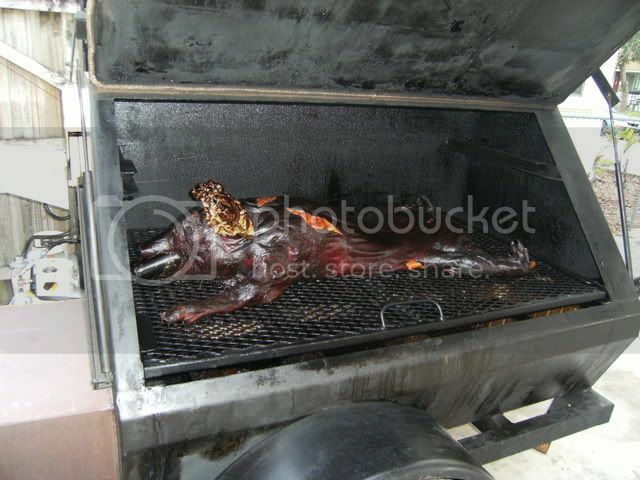 It is however a big deal if your client wants to eat at 6 PM and the pig won�t be done till 8! Note: The radiant heat coming off the bottom plate in my reverse flow cookers always seems to cook quicker than my traditional off-set. 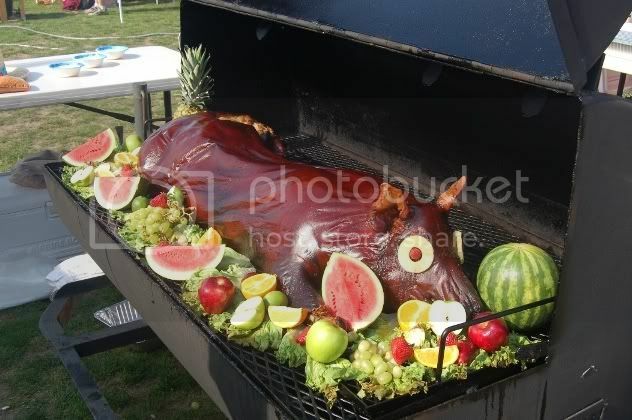 The pig is done, the guests are hungry, how do I serve the pig? For catered events, I always request that the client provide two tables for the buffet line. That way they continue to enjoy the food after we leave to clean-up. I don�t have to make a second trip to collect my own tables. For pig roasts, we do bring our own carving table. I set the table up (foil covered, plastic sheet under to protect flooring) at the end of the serving line. 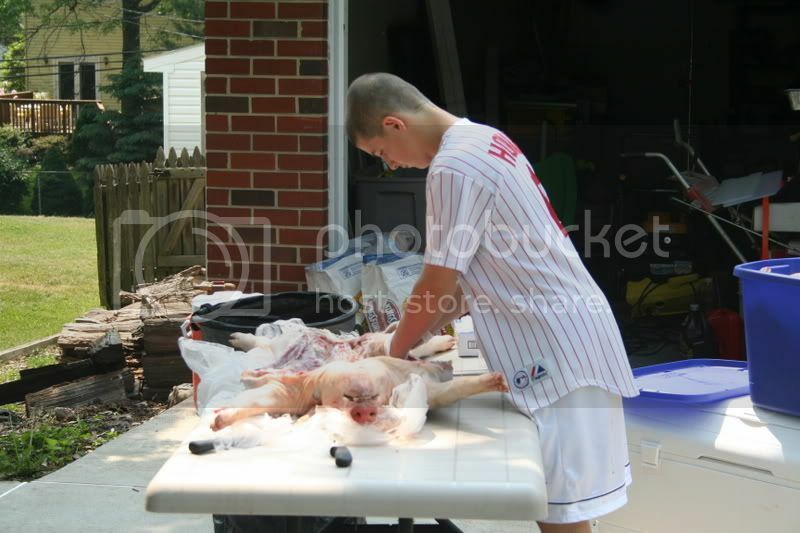 I carve (pull) the pig as the guests come through the line. 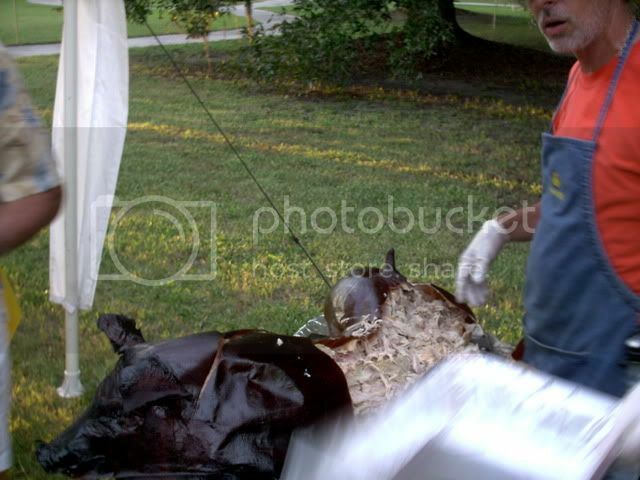 Part of a pig roast is the �show�, and the guests are always amazed at the sight of a whole pig being pulled apart! 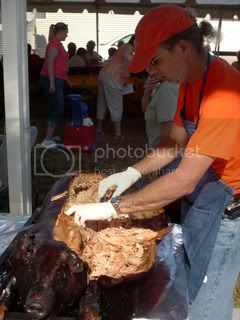 I finish pulling the pig after the initial serving has been done, and leave any leftovers on the buffet line for seconds. When I have a group that is slightly too big for one pig, but not big enough to warrant a second pig, I bring a pan of pulled pork to cover the extra. I also do the same for big eaters like construction workers. Unlike pulled pork or ribs, the exact yield is never really predictable. If you run out of pulled pig that is a problem! 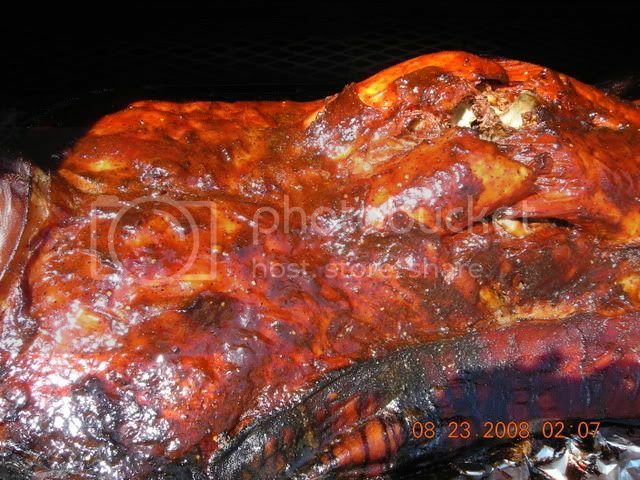 Bring extra pulled pork if there is any doubt, particularly till you �get the feel� for how far an actual pig goes. There is some �learning by doing� involved, and experience is often the best teacher. 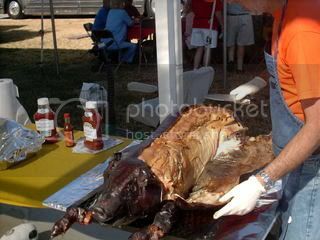 Speaking of that, you best bet is to do your first pig roast for families and friends, not a paying client! I noticed when I cooked my first (and only thus far) pig that the under belly on the inside of the pig was not quite "pullable" where as the rest of the pig was. I was thinking that maybe it was because I didn't think to prop open the belly cavity so the heat/air could enter the cavity??? I have also heard/read where some actually insert chickens, fruits and other such things into the cavity before cooking and then serve these items with the pig....Have you (or anyone else here) done this and if so, what were your results?? My son was telling me that someone told him to put 2-3 loaves of torn/chopped cheap white bread in the cavity...I am thinking this is to collect (absorb) the grease?? I am thinking (for cook time purposes) and becasue I have the room, of doing smaller pigs instead of 1 large. 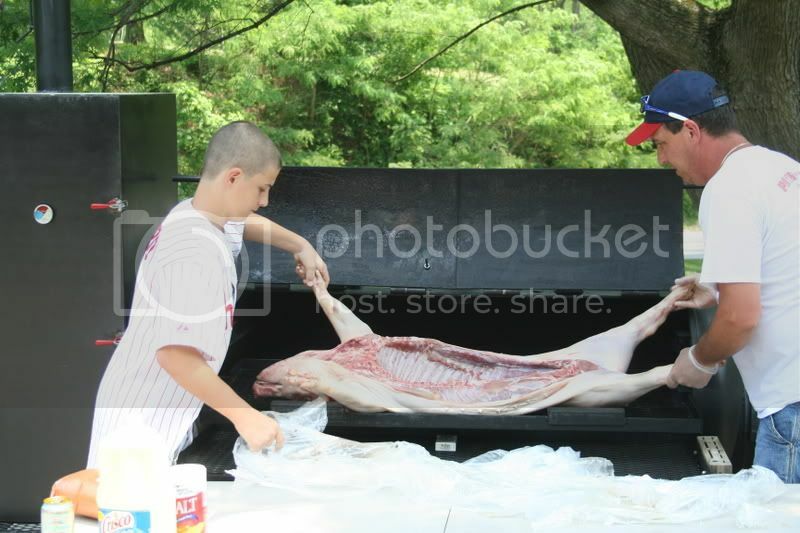 For instance, if the group is 80 people, do 2 small 40 lb pigs instead of 1 large?? 2 small ones would cook in 6-8 hrs instead of 16-18 hrs a large one would take....just wondering. Is this something you would recomend or not???? 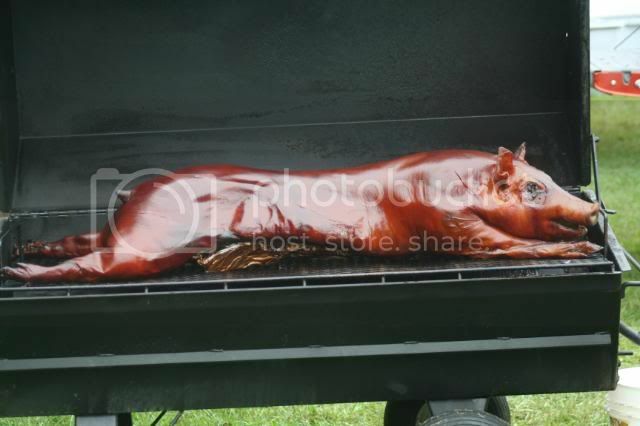 Do you find it necessary to reposition the hog when you cook on an off-set? Or do you leave the shoulders close to the fire box throughout the cook? Thanks for your time. 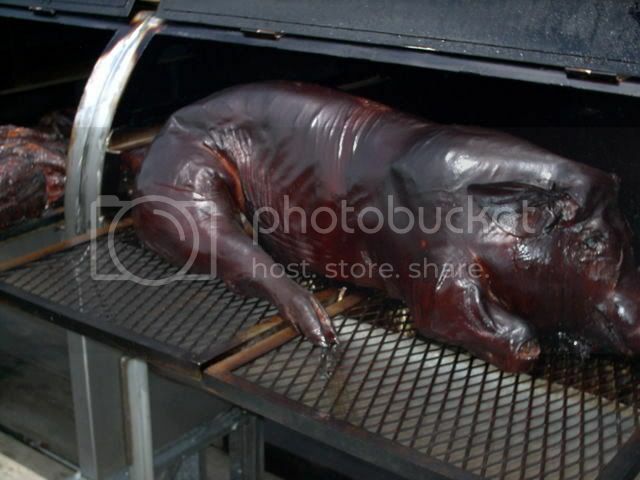 I just did my first whole hog and made the mistake of cooking one too big for my cooker. Even though I got the hog in (pics at http://slowfoodrebellion.blogspot.com - scroll down a bit to find the pics) I found that because I had the hog too low in the chamber the hind end (hams cooked away from the off-set) never got abouve 140-150* in the 24 hours I cooked the thing (135 lbs without the head). Thus I assumed that the hams weren't o.k. to serve as they had to have been below 140* too long to be safe! The shoulders and ribs were wonderful - but the hams were wasted! If there's a new way - I'll be the first in line. But it better work this time! Marv: no on stuffing smoked pigs, same as for stuffed bird. The internal temps do not come up quick enough to remain safe. Also no (for me) on the two pigs are better than one idea. There is more waste with two 40 pound pigs than with one 80 pound pig through default. Monty: I position the pigs in the end of my offset furthest away from the firebox. I have an unusually large pit. The Stumps cooker is basically the same method, I do position the pigs with the ham's toward the hottest end. Once they are set in place, they are not moved (once again using my cooking method). Good point, and one that I had forgotten to mention- a pit too small for said sized pig is asking for trouble. I had the hog too low in the chamber the hind end (hams cooked away from the off-set) never got abouve 140-150* in the 24 hours I cooked the thing (135 lbs without the head). Thus I assumed that the hams weren't o.k. to serve as they had to have been below 140* too long to be safe! According to the regulating authorities; "Pork is fully cooked and safe to eat at 135 degrees", so that kinda blows the 140 rule out of the water. the hams will be tender enough to eat at that temp, but the shoulders will be on the tough and rubbery side. But you stated you had a 24 hour cook time, so that could be something like a weird science experiment in bacteria too. As for stuffing a pig, I feel it can create a safe haven for all sorts of bacteria found in the intestinal cavity of animals. 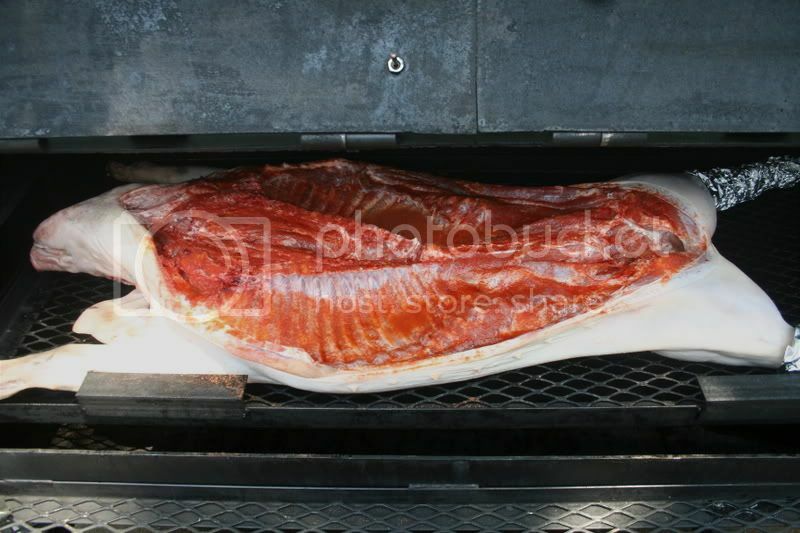 But at the same time the tender juicy backloins are located right above that cavity and could use some protection to keep them from becoming pork jerky from over cooking. 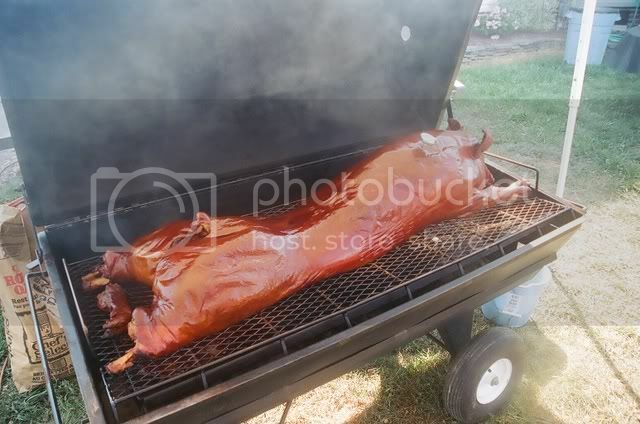 When I cook pig's underground (Luau Style) I will fill the cavity with hot rocks from the firepit, or sometimes I fill the cavity with whole chickens, or onions & oranges to act as a heat sink to keep the ribs & loins from being destroyed. But those cooking temps are way higher then the low & slow of 225-240 many use as a benchmark and may cause spoilage. The chickens used for stuffing are tossed when used, not eaten. you do not need to open the cooker every 5 minutes so all the guests can get the pictures that they want and lose precious cook time everytime the lid is opened. Post up some of those rotisserie pics Harry, that is an impressive sight to be sure! Actually, low and slow has never stopped any picture taking opportunities. As mentioned, I don't rely on the pig(s) being done at a critical timing interval, so opening up the cooker doors isn't an issue (for me). 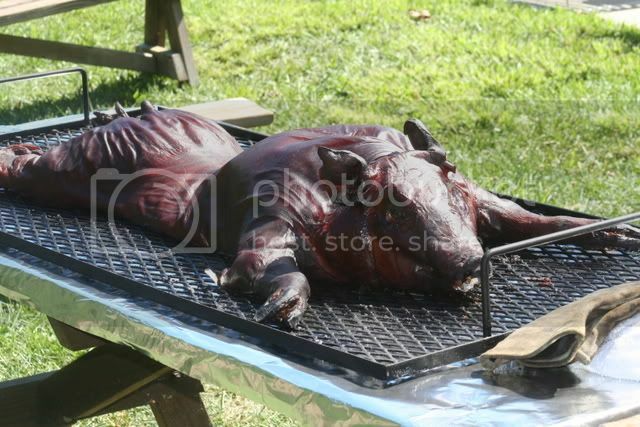 I also let the pig rest on it's serving table about 1/2 hour to 45 minutes to cool for a bit before pulling. And yes, the guests do enjoy a photo opportunity. Great topic Mike. Thanks! This might just get me to smoke my first pig. How easy is it to butterfly a raw pig and what are the desired tools? Butterflying is always my preferred method to cook any whole animal as it reduces the cooking time, and increases the surface area of the meat exposed to seasoning, smoke, and heat. The cavity usually ends up tasting and looking better. I like the small pig idea. Afterall, it's all for show and butts taste better anyway and they will both be finished around the same cooking time. 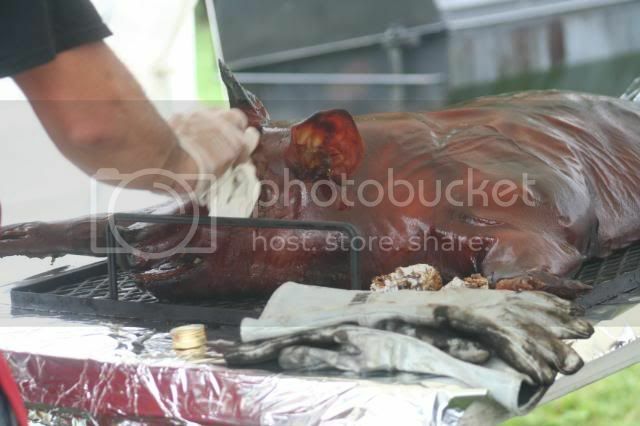 Out of curiosity, how much smoke actually penetrates that thick pig skin? I've tried roast pigs and the rottiserie pigs and don't recal much difference in taste. I cook racing style for a couple of reasons Jerk Pit. 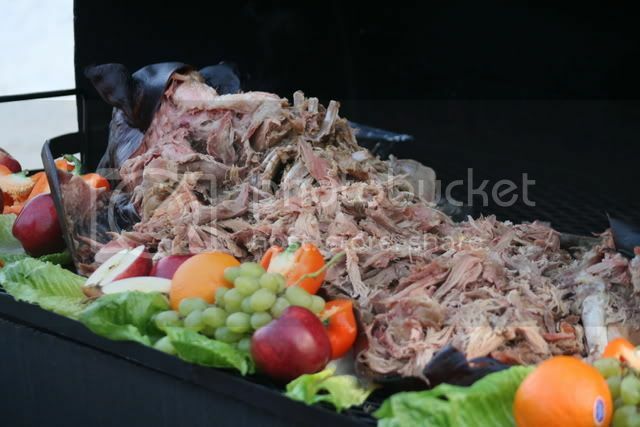 It is "self basting", and the pork comes out with a mild smoky flavor. Not much penetrates that thick skin, but the meat doesn't dry out either. The mild smoke flavoring comes from the smoke that gets in through the open cavity. I don't smother my meats in sauce and seasonings, so this isn't an issue for me. For someone that does great Jerk seasonings like yourself, I could see a different cooking metod as being an advatage. I don't do butterflied, but I have seen them done that way. Splitting the back-bone is what it takes to have them lay flat open. They also take up twice as much grate area, so if you are limited for space it's not an option unless you do two half pigs. Presentation is not going to be real pretty at that point either. My Stumps could cook butterflied open no problem- the grate is 3x5 feet. 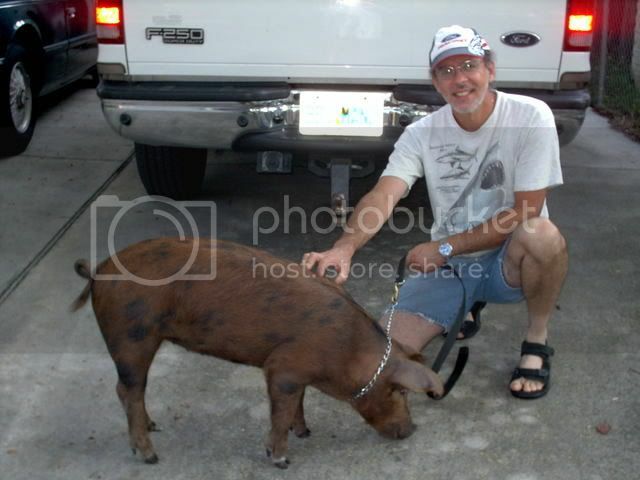 Dan (mutha chicken) has some great pics of butterflied pigs, where are they Dan? Wow I can't believe I missed this whole stickey for so long. Great topic Mike. I do my pigs both butterflied and Racer style. The 2 have great results and niether one is better than the other although I have my preference for me personally. I would love to have the oppritunity to roast one like Harry someday. here's some Pics from pigs in the past. 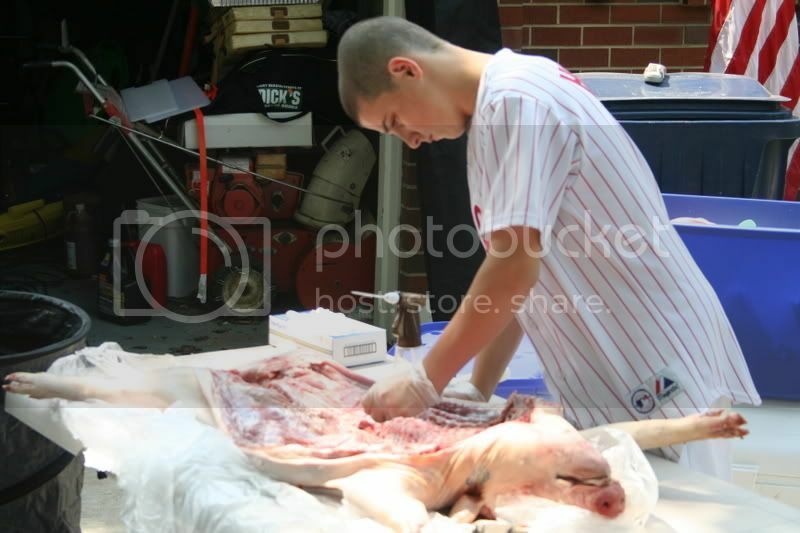 Don't forget to prep them, I take the silver skin off the ribs, Cut ouot the tenderlions and Hide them under the ribs. So they don't burn up. Cut out any unwanteds. And season. There are a couple of more things I do but they are specific to wich way I am doing it. You asked for a sticky (great idea), and you got it! I really liked the one all sauced up. That thing looks very tasty! Me very very hungry...Lookin good guys!!!!!!!!!!! here is a few of the open roasting method, both on the spit and garnished for serving. Nice Pics Harry,Love the close up! I saw a guy use one of these for splitting the spine. Thought it was very inventive. I also split the ribs from the backbone as opposed to the spine. The only thing I will add beings this is a "sticky" for people to learn from is I found once cooked, it is easier to cut the hide with sissors than a knife. I am looking at making some changes to one of my pits and am looking for the approx dimensions of a 75 # pig cooked racing style.. Need length, width and height.... I know it varies, but an estimate would be appreciated. You will need a 2x5 ft area, Although there are exceptions, there really isn't much difference between a 75-100lb hog as far as length. They just start getting fuller or rounder as they go up. That is with the head on and rear legs rolled up under. Although they sometimes come with the rear legs straight out the back. And may cause you to have to trim them down a bit. Well that may put you down to the 60lber range on the 48" Grate. But you could always remove the head if needed. Dan and Harry those are great pictures. I am hoping that in the near future I will jump in and try one myself. Just need a bigger smoker which I hope is in my future.